Do you ever wonder who’s helping you optimize your webpages? Who works hard to ensure your payments get to you on time? Who works with our product and engineering teams to deliver the products and features that you want? Over the next few weeks you’ll find out just that! We’re kicking off a video series where you’ll meet some of our AdSense team members. You can hear their stories, learn more about their role in AdSense, and listen to the tips they have to offer. In the first video, Debby, a member of the AdSense Optimization team talks about her favorite websites, what she likes about working for Google, and the Google products that she recommends every publisher try. for AdSense, where you could tell us what product and feature updates you’d like to see. We received over 600 ideas from publishers all around the world, with ideas ranging from ad filtering options to increased transparency, and more detailed reporting to easier account management. You asked for...More transparency about how much you’re earning from AdSense. What we’ve delivered...The AdSense for content and AdSense for search revenue shares are now publicly shared. You asked for...The ability to block certain categories of ads, like religion and dating. What we’ve delivered...Category blocking (previously known as category filtering) is now available in 13 languages. You can filter up to 11 ad categories, including religion, dating, politics and weight loss. You asked for...Make it easy to change addresses when we move from one location to a new one. 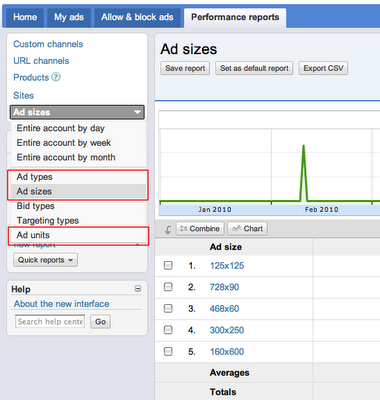 You asked for...Automatic revenue tracking to quickly and easily compare performance of ads of different sizes and types. What we’ve delivered...The new AdSense interface offers Ad units, Ad sizes, and Ad types reports in the Performance Reports tab. These detailed reports can help you understand which individual ad units, ad sizes, and ad types perform best on your site. You asked for...The ability to view data for a custom date range, similar to Google Analytics. 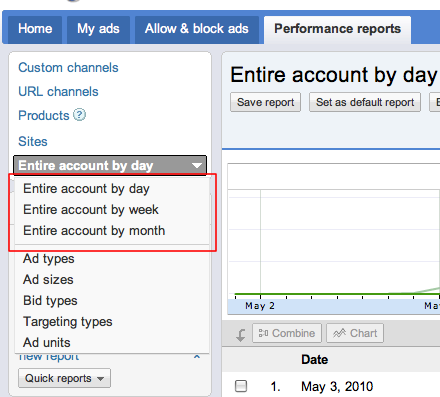 What we’ve delivered...The new AdSense interface includes a date range selector just like Google Analytics. Plus, to see how your earnings have changed over time, we also have a feature that allows you to compare two date ranges. Simply select the date range you want to compare, check “Compare to other dates”, fill in the start date, and we’ll fill in the end date for you! What we’ve delivered...Reports by week and month, in addition to by day, are available in the Performance Reports page. Along with reports for “Entire account by day” you can choose from weeks and months. If you’d like the new beta interface enabled in your account, you can make a request. Thanks for all your ideas and votes. Your ideas and feedback help our teams determine where we should be spending our time, so keep them coming! A few months ago, we created a Product Ideas page for AdSense, where you could tell us what product and feature updates you’d like to see. We received over 600 ideas from publishers all around the world, with ideas ranging from ad filtering options to increased transparency, and more detailed reporting to easier account management. Fiction: Site maintenance periods and delays in my AdSense reports mean that data isn’t being recorded properly. Fact: Although there can sometimes be delays in the stats pipeline, all data is still tracked accurately. We call the process of tracking your clicks, impressions, and earnings the “stats pipeline.” The stats pipeline runs continuously, reviewing the logs of activity written by our ad serving system, aggregating them, and updating the storage system. So that we can generate these statistics quickly and reliably, without losing any information, the process of aggregating your statistics spans several data centers. We sometimes make updates to our datacenter to make use of the latest technologies. However, these don’t affect how your clicks are tracked or how much you earn. Depending on the time it takes for the updates to complete, you may notice that stats are delayed by several hours. We have scheduled database down-times, generally on Saturday mornings (Pacific Time). Since the process of aggregating your statistics depends on database data, any such downtime also leads to delay in statistics. I’d recommend reading this Inside AdSense post for more information about these downtimes. On rare occasions, data centers can have unforeseen problems, causing unplanned delay in updating statistics. These downtimes only delay your statistics -- they don’t impact the actual tracking of your statistics. We make sure that all events are processed exactly once, and we have implemented a number of internally and externally audited verification procedures to ensure that this is the case. Also, events in the aggregation pipeline are processed in a way that’s not specific to a particular publisher, so all of you should get your stats updates at the same time. When downtimes occur, we work to notify publishers in advance and as quickly as possible using this blog, the AdSense Help Forum, and our Known Issues page. We understand how important it is for you to have up-to-date statistics, and continue to work towards making sure that the delays are kept to a minimum. and display advertising spend to your sites. We’ve added new advertisers and introduced options that help these advertisers reach your sites. At the same time, advertisers have continued to run ads on YouTube and our own properties. To make our display media offerings clearer to advertisers and agencies so that we can continue to bring more display spend to your sites, we’re creating a new umbrella name for all these properties, the Google Display Network. The Google Display Network will comprise all of the sites where advertisers can buy ads through Google, including the over one million AdSense and DoubleClick Ad Exchange partners as well as YouTube and Google properties such as Google Finance, Gmail, Google Maps, and Blogger. As an AdSense publisher you’re already part of the Google Display Network. We’re not making any changes to how AdSense works, so no action is required on your part. If you use AdSense for search, your AdSense for search ad space won't be part of the Google Display Network. Advertisers will continue to be able to purchase ads on your search results pages in the same way they always have. While this new name reflects our significant investment to bring more display advertising to your sites, we want to make sure you know that we are still committed to delivering relevant text ads. If you receive text ads on your sites today, rest assured that you will continue to do so. The Google Display Network offers all ad formats - text, image, rich media, and video ads - enabling advertisers to unleash their creativity and engage visitors on your websites in various ways. If you haven’t opted into receiving image ads, we encourage you to do so in order to benefit from the investments we’ve made. We’re working hard to offer the best display advertising solutions, and we look forward to continuing to introduce new features on the Google Display Network that help advertisers reach their goals and that help our AdSense publishers earn more revenue. We’re always focused on improving AdSense by bringing more advertisers to your sites, giving you more control over the ads that appear on your sites, and giving you more transparency into how much revenue you’re earning. Over the past year, much of our focus has been on attracting more display advertisers and display advertising spend to your sites. We’ve added new advertisers and introduced options that help these advertisers reach your sites. At the same time, advertisers have continued to run ads on YouTube and our own properties. To make our display media offerings clearer to advertisers and agencies so that we can continue to bring more display spend to your sites, we’re creating a new umbrella name for all these properties, the Google Display Network.